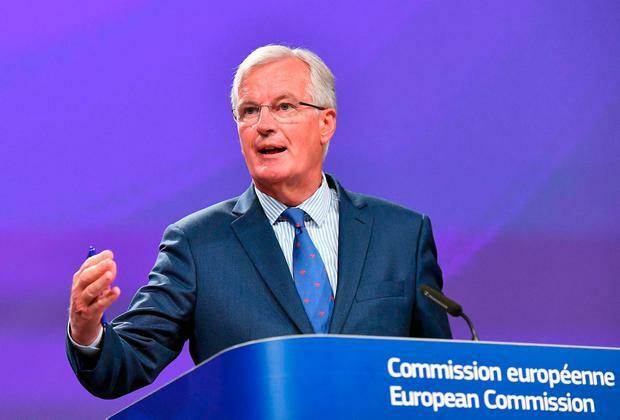 Michel Barnier has accused the UK of using Ireland as a "test case" for its future customs relationship with the European Union. The EU's chief Brexit negotiator said Britain's position paper on Ireland and Northern Ireland "worries" him. "The UK wants to use Ireland as a kind of test case for the future EU-UK customs relations. This will not happen," Mr Barnier said. "Creativity and flexibility cannot be at the expense of the integrity of the Single Market and the Customs Union. This will not be fair for Ireland, and it would not be fair for the European Union." Mr Barnier said sufficient progress is required to move forward to the next phase of the negotiations. The European Commission today published a four page position paper on Ireland, in which it states that the "onus to propose solutions which overcome the challenges created on the island of Ireland by the United Kingdom's withdrawal from the European Union and its decision to leave the customs union and the internal market remains on the United Kingdom". The paper also states that it is the UK's responsibility to ensure that its approach to the challenges of the border takes into account and protects the very specific and "interwoven political, economic, security, societal and agricultural context and frameworks on the island". "These challenges will require a unique solution which cannot serve to pre-configure solutions in the context of the wider discussions on the future relationship between the European Union and the United Kingdom," the paper states. At a press conference in Brussels today, Mr Barnier said he sees the issues facing Ireland as a "special responsibility", including the responsibility to preserve the peace process, the gains of the Good Friday Agreement in all its parts, maintain the Common Travel Area and avoid a hard border. He said the two parties must first agree political principles, and that discussing technical solutions would be premature. Mr Barnier said the Commission was working "hand-in-hand" with the Irish Government. "We are seeing in these negotiations that Ireland's interest is the [EU] 27's interest, and vice versa," Mr Barnier said. Mr Barnier said that on the Good Friday Agreement, the UK, as co-guarantor, needs to put solutions forward, in particular to ensure that the institutions created by the agreement can continue to operate. He said a hard border needed to be avoided, while respecting Ireland's place in the Single Market. North/South cooperation will need to be preserved in all areas, he said. "Irish citizens residing in Northern Ireland must continue to enjoy their rights as EU citizens," Mr Barnier said. He also said the EU would honour its financial commitments in favour of peace process programmes. "We expect the UK to do the same as part of its financial settlement. But we are not there yet," Mr Barnier added. "The solution for the border issue will need to be unique, it cannot pre-configure the future relationship between the European Union and the UK. It will require both sides to be flexible and creative. "What I see in the UK's paper on Ireland and Northern Ireland worries me."